Thank you for your service, sister. RIP. Rest in peace Agent Doss! 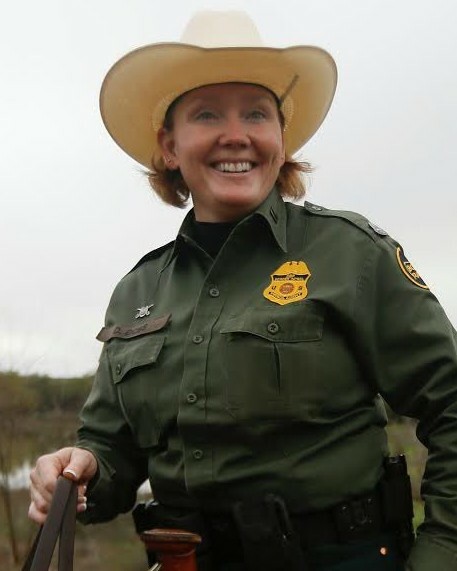 I am sorry to learn of the passing of a sister and hero Border Patrol Agent Donna Doss. May our Heavenly Father welcome her home into his loving arms where she will now patrol the Golden Streets of Heaven. May the Lord deliver blessings, comfort and peace to her family, friends and members of United States of Homeland Security. May God bless you and your family. You paid the ultimate sacrifice. May you rest in peace my sister in blue. God bless and God speed Agent Doss. We have the line now. May God rest her Soul! Prayers sent for Agent Doss and her family. My sincere sympathy goes out to the Brothers and Sisters of the U.S. Border Patrol. Rest in peace sister. Thank you for your service. God's speed ma'am. Lord God, our hearts and prayers go out to the United States Border Patrol and for the family, friends, and colleagues of Border Patrol Agent Donna Doss, of the United States Border Patrol, who was killed in the Line-of-Duty on Saturday, February 2, 2019. Father God, have mercy on us and their souls. Rest easy my Sister-in-Blue. We will take it from here! Now, join the Lord and rejoice in Paradise! God speed! Amen. Will be thinking of you agent Ross. Rest in Peace. Rest in Peace, Agent Dodds. You deserve your divine reward. God bless and protect those that protect us all. ★ Rest in peace and God speed... May St. Micheal carry you to the Heavenly throne. Thank you for your Service... Slow Hand SALUTE! My family and I would like to extend our sincere condolences to the family, friends, and fellow co-workers of Border Patrol Agent Donna Doss during this difficult time. May they find comfort and support from those around them. May happy moments from the past bring forth precious memories to cherish for a lifetime. May God help heal their aching hearts. Thank you for your service and may you rest in peace Border Patrol Agent Donna Doss. Rest easy Officer Doss, thank you for your service. You won’t be forgotten. Donna was my partner, co-case Agent, and great friend when we served together at the DEA Task Force in Eagle Pass, TX for a couple of years. She was tenacious, smart, fun-loving, fiercely loyal, strong, hard-working and easily brought to laughter or to a good cuss'n. She loved her temporary assignment to DEA and was a great friend to the Agency, and to the Agents/Officers she worked alongside. Donna became a fine criminal investigator, working more and more complex investigations as she gained experience. She was devoted to her husband and was a true horse whisperer. She was a committed civil servant - a hero, I was proud to call my friend.